Faster lasers=better memory; echo location; quantum-dot spectrometer. 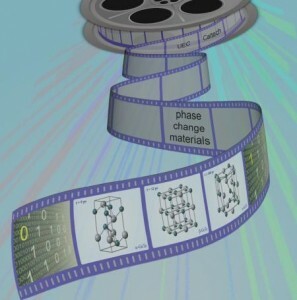 To visualize in four dimensions the changing atomic configurations of materials undergoing phase changes — which happens when data is recorded on DVDs and Blu-ray disks — Caltech researchers have adopted a novel technique called ultrafast electron crystallography (UEC) that uses ultrafast laser pulses that speed up the data recording process. Interestingly, as part of this work, the researchers discovered a previously unknown intermediate atomic state that may represent an unavoidable limit to data recording speeds. They stressed this is meant to provide a better understanding of the fundamental physical processes involved in data storage, in the hopes of leading to better and faster computer memory systems with larger storage capacity. The research was done in the laboratory of Ahmed Zewail, Linus Pauling Professor of Chemistry and professor of physics at Caltech. The researchers said the next step is to use UEC to study the transition of the amorphous atomic structure of GeTe back into the crystalline phase—comparable to the phenomenon that occurs when you erase and then rewrite a DVD. “Understanding the fundamental behavior of materials transformation is what we are after, and these new techniques developed at Caltech have made it possible to visualize such behavior in both space and time,” Zewail said. Thanks to University of California, Berkeley physicists who have used graphene to build lightweight ultrasonic loudspeakers and microphones, people can now mimic the ability of bats or dolphins to use sound to communicate and gauge the distance and speed of objects around them. Practically speaking, the wireless ultrasound devices complement standard radio transmission using electromagnetic waves in areas where radio is impractical, such as underwater, but with far greater fidelity than current ultrasound or sonar devices, the researchers noted. The devices can also be used to communicate through objects, such as steel, that electromagnetic waves can’t penetrate. 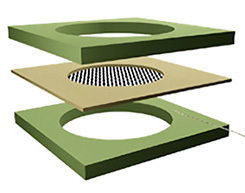 While speakers and microphones both use diaphragms — typically made of paper or plastic — that vibrate to produce or detect sound, respectively, the diaphragms in the new devices are graphene sheets one atom thick that have the right combination of stiffness, strength and light weight to respond to frequencies ranging from subsonic (below 20 hertz) to ultrasonic (above 20 kilohertz). Humans can hear from 20 hertz up to 20,000 hertz, whereas bats hear only in the kilohertz range, from 9 to 200 kilohertz. The grapheme loudspeakers and microphones operate from well below 20 hertz to over 500 kilohertz. The atom-thick sheet of graphene is so lightweight that it responds immediately to an electronic pulse, unlike today’s piezoelectric microphones and speakers, which comes in handy when using ultrasonic transmitters and receivers to transmit large amounts of information through many different frequency channels simultaneously, or to measure distance, as in sonar applications, the researchers pointed out. Graphene membranes are also more efficient, converting over 99 percent of the energy driving the device into sound, whereas today’s conventional loudspeakers and headphones convert only 8 percent into sound, they said, and anticipate in the future, communications devices like cellphones will utilize not only electromagnetic waves – radio – but also acoustic or ultrasonic sound, which can be highly directional and long-range. MIT scientists have shown they can create spectrometers — usually too large to be portable — small enough to fit inside a smartphone camera, using tiny semiconductor nanoparticles called quantum dots. Instruments that measure the properties of light, known as Sspectrometers, are widely used in physical, chemical, and biological research. If small enough to fit inside a smartphone cameras, these could be used to diagnose diseases, especially skin conditions, or to detect environmental pollutants and food conditions. This work also represents a new application for quantum dots, which have been used primarily for labeling cells and biological molecules, as well as in computer and television screens, the researchers said. Spectrometers are used in a wide variety of applications, such as studying atomic processes and energy levels in physics, or analyzing tissue samples for biomedical research and diagnostics and replacing bulky optical equipment with quantum dots allowed the MIT team to shrink spectrometers to about the size of a U.S. quarter, and to take advantage of some of the inherent useful properties of quantum dots. Quantum dots are a type of nanocrystals discovered in the early 1980s, made by combining metals such as lead or cadmium with other elements including sulfur, selenium, or arsenic. By controlling the ratio of these starting materials, the temperature, and the reaction time, a nearly unlimited number of dots can be created with differences in an electronic property known as bandgap, which determines the wavelengths of light that each dot will absorb. But most of the existing applications for quantum dots don’t take advantage of this huge range of light absorbance, the MIT researchers said, and instead exploit quantum dots’ fluorescence — a property that is much more difficult to control since it is very hard to make something that fluoresces very brightly. In this illustration, the Quantum Dot (QD) spectrometer device is printing QD filters — a key fabrication step. Other spectrometer approaches have complicated systems in order to create the optical structures needed. 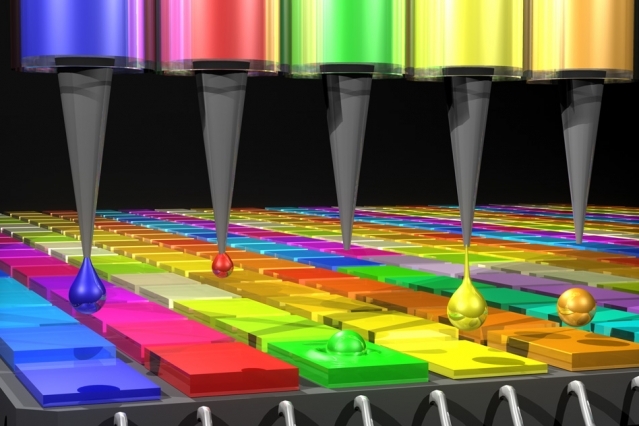 Here in the QD spectrometer approach, the optical structure — QD filters — are generated by printing liquid droplets. This approach is unique and advantageous in terms of flexibility, simplicity, and cost reduction. Further, while scientists are working on solar cells based on quantum dots that rely on the dots’ ability to convert light into electrons, the phenomenon is not well understood, and is difficult to manipulate. But, the absorption properties of quantum dots are well known and very stable.